In this course, we’ve focused on three goals for macroeconomics: full employment, stable prices (low inflation), and economic growth. We know that the economy tends to growth over time as a result of increases in the quantity and quality of labor and capital and improvements in technology. We also know that the path of the economy can be disturbed by shocks to aggregate demand or aggregate supply. We have learned about the limits to fiscal and monetary policy in the real world. Taking those into account, what policies would Keynesian and Neoclassical economists be likely to propose to promote those goals? That is the subject of this section. Recall that neoclassical economists are predisposed towards market outcomes and are suspicious of using aggregate demand to manage the economy. By contrast, Keynesian economists are suspicious of market outcomes and lean towards demand management policies, both fiscal and monetary policy to try to improve market outcomes. Let’s take another look at business cycles. As explained earlier in the module on Macroeconomic Measures, unemployment can be divided into two categories: cyclical unemployment and the natural rate of unemployment, which is the sum of frictional and structural unemployment. Cyclical unemployment results from fluctuations in the business cycle and is created when the economy is producing below potential GDP—giving potential employers less incentive to hire, since there is less demand for their products. When the economy is producing at potential GDP, cyclical unemployment will be zero. Because of the dynamics of the labor market, in which people are always entering or exiting the labor force, the unemployment rate never falls to 0%, not even when the economy is producing at or even slightly above potential GDP. Due to imperfect information, it takes time for job seekers and employers to find each other. This search time causes frictional unemployment and is socially efficient when it puts people in the right jobs for them. Probably the best we can hope for is for the number of job vacancies to equal the number of job seekers. Most economists do not consider frictional unemployment to be a “bad” thing. After all, there will always be workers who are unemployed while looking for a job that is a better match for their skills. There will always be employers that have an open position, while looking for a worker that is a better match for the job. Ideally, these matches happen quickly, but even when the economy is very strong there will be some frictional unemployment. Structural unemployment, where job seekers lack marketable skills, is a more serious matter, requiring deliberate policies to address. A decrease in aggregate demand causes a recessionary gap with increased unemployment. The question is what to do about it. If the economy is self-correcting, the unemployment and lack of sales will, over time, cause wages and prices to fall. shifting the AS curve to the right and returning the economy to full employment and potential GDP. Keynesian economists worry about the loss of jobs and income that may persist over time. For this reason, their preference is to stimulate aggregate demand to speed up the recovery and get people back to work. Additionally, Keynesians prefer increases in government spending to tax cuts. The former lead directly to increased aggregate demand, while the latter can be less effective if individuals and businesses don’t spend all of their tax cuts. The deeper the recession, the more resources are unemployed and the less crowding out will result from expansionary fiscal policy. So Keynesians believe it makes sense to try to reduce the depth and duration of recessions. Similarly, Keynesians argue for contractionary fiscal and monetary policy to offset an inflationary gap. As we explained in the Macroeconomic Measures module, inflation has both distributional and real costs as well. Keynesians hope a more active policy will reduce those social costs. Both of these scenarios are shown in Figure 2 below. Figure 2. The Keynesian Approach to Fighting Recession and Inflation. 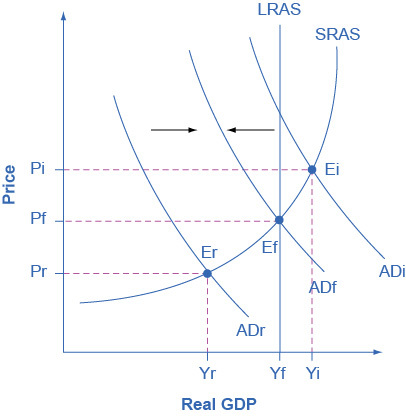 If an economy is in recession, with an equilibrium at Er, then the Keynesian response would be to enact a policy to shift aggregate demand to the right from ADr toward ADf. If an economy is experiencing inflationary pressures with an equilibrium at Ei, then the Keynesian response would be to enact a policy response to shift aggregate demand to the left, from ADi toward ADf. The neoclassical view of unemployment tends to focus attention away from the problem of cyclical unemployment—that is, unemployment caused by recession—while putting more attention on the issue of the unemployment that prevails even when the economy is operating at potential GDP. Neoclassicals think that given the real world complications of fiscal and monetary policy discussed above, it is too difficult to get them right. Better to simply let the economy adjust back to potential output on its own. The neoclassical view of unemployment tends to focus on how public policy can be used to reduce the natural rate of unemployment. Such policy changes might involve redesigning unemployment and welfare programs so that they support those in need, but also offer greater encouragement for job-hunting. It might involve redesigning business rules with an eye to whether they are unintentionally discouraging businesses from taking on new employees. It might involve building institutions to improve the flow of information about jobs and the mobility of workers, to help bring workers and employers together more quickly. For those workers who find that their skills are permanently no longer in demand (for example, the structurally unemployed), policy can provide opportunities for retraining so that these workers can reenter the labor force and seek employment. Note that Keynesian economists also support improved labor market functioning and retraining for the structurally unemployed. Neoclassical economists will not tend to see aggregate demand as a useful tool for reducing unemployment; after all, if economic output is at or near potential, then aggregate demand has no significant effect on unemployment. This is shown by the vertical aggregate supply curve. Instead, neoclassical economists believe that aggregate demand should be allowed to expand only to match the gradual shifts of aggregate supply to the right—keeping the price level much the same and inflationary pressures low. That’s a job for monetary policy, with the supply of money growing at a stable rate, say the Neoclassicals. If aggregate demand rises rapidly in the neoclassical model, in the long run it leads only to inflationary pressures. 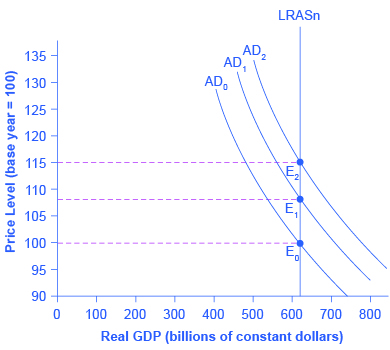 Figure 3 shows a vertical long-run AS curve and three different levels of aggregate demand, rising from AD0 to AD1 to AD2. As the macroeconomic equilibrium rises from E0 to E1 to E2, the price level rises, but real GDP does not budge; nor does the rate of unemployment, which adjusts to its natural rate. Conversely, reducing inflation has no long-term costs, either. Think about Figure 2 in reverse, as the aggregate demand curve shifts from AD2 to AD1 to AD0, and the equilibrium moves from E2 to E1 to E0. During this process, the price level falls, but, in the long run, neither real GDP nor the natural rate of unemployment is changed. Figure 3. How Aggregate Demand Determines the Price Level in the Long Run. As aggregate demand shifts to the right, from AD0 to AD1 to AD2, real GDP in this economy and the level of unemployment do not change. However, there is inflationary pressure for a higher price level as theequilibrium changes from E0 to E1 to E2. The recessions of 1990 and 2001 were each so short that had the government attempted fiscal or monetary stimulus, the economy would have been already recovering when the stimulus kicked in, creating an inflationary boom. Neoclassical policies would have been the right call. During the recession of 1982-83, however, letting the economy fix itself would have made a long and deep recession even worse. This recession was caused by a serious monetary contraction, which successfully wrung inflation out of the system. Inflation has been under control in the U.S. since then. In the early 1980s, the Reagan administration conducted a series of significant tax cuts over the period 1981-83. This was followed by an increase in defense spending which raised overall Federal spending. While the purpose of this fiscal expansion was ideological, rather than to counter the recession, the effects did in fact do so, leading to the longest peacetime expansion in modern U.S. history. Monetary policy was also accommodating during this time. The Obama administration’s response to the Great Recession (2007-2009), as we have noted before, was explicitly expansionary. The consensus of most macroeconomists is that fiscal and monetary stimulus helped end the recession; indeed, some argue the stimulus should have been greater.